Some horses, especially those with pink skin, can suffer painful sunburns which produce blisters around the eyes, muzzle, lips, flanks and sheath. 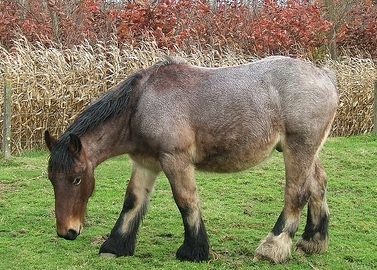 Appaloosas, Paints, Pintos, horses with white or pale markings are more prone to sunburn distress. Melanin, the pigment that protects skin from sunburn, is absent in pink-skinned horses. Sunburn can also lead to squamous cell carcinoma, an aggressive cancer. Signs of sunburn are redness, blisters, peeling, scaly skin, skin that is painful to the touch, a horse that becomes head shy. Horses with sunburn should not be ridden. Sunburn that is not severe can be treated with creams and salves such as aloe vera and diaper rash cream containing zinc oxide. It’s a good idea to ask your vet which one is suitable for your horse and where and how often to apply. Prevention of course, is the best treatment. UV resistant sheets that cover the full body, full face fly masks, UV resistant leg protection, all can be used. Apply sunscreen with SPF 30 frequently on small areas but not near eyes. Again, check with your vet if this is appropriate for your horse. On hot, sunny days, keep your horse indoors when the sun is at its height, between 9-10 AM to 3-4 PM. If you are unsure and need help in treating sunburn or it is severe, call your vet immediately.